Want your kitchen to stand out? With 2016’s trending looks and styles, you’re sure never to be short of inspiration. So far this year we have seen a resurgence in traditional and classic design. However, this time around everything is being given a stylish contemporary twist, to bring modern efficiency and clean lines to those old ideas. Here are a list of our favourite kitchen trends and ideas for 2016, with plenty of ideas sure to inspire the renovation bug in everyone. Let us know your favourite! Marble features have made a huge comeback, and not just in the home. From technology to high fashion, marble is truly on trend in 2016. And no wonder why! Marble is a timeless classic that will make any kitchen feel elegantly luxe. Unfortunately, real marble surfaces can be costly, and therefore not very practical if you are on a tight budget. Luckily, there are some fantastic look-alike alternatives that will give your kitchen the marble-value, without the marble-price. If you incorporate a marble statement into your kitchen, consider using imitation laminate, quartz, concrete, or even a painted marble finish on surfaces. A popular trend are marble inspired splashbacks, which are an ultra-modern way to bring the stunning depth and texture of marble into your home. If you’re looking for a simpler way to incorporate marble into your kitchen, look no further than marble tableware and accessories. With marble and faux-marble cutting boards, cutlery, and so much more, you can subtly incorporate this trend for a fraction of the cost. Marble looks fantastic paired with other natural materials including wood and glass, and can be used for any occasion, be it a fancy dinner party or a rustic inspired lunch. The Industrial Age has made a surprisingly chic return in 2016 with a boom in raw wood, black metals and glass accents. This is a perfect trend because it can be transformed into a variety of styles. From rustic farmhouse to contemporary loft, the industrial trend is very versatile and therefore, very in-demand. A major feature of the industrial style is hanging pendant lights, which can be installed and fitted to your kitchen relatively quickly and at a low cost. A fantastic statement for your kitchen, these pieces will effortlessly brighten up benches and islands, whilst also making use of underutilised ceiling space. A great look for kitchens going for darker colour scheme such as a matte grey or black, the industrial trend is all about moody depth balanced with inviting warmth. 2016 is all about playful pops of colour. In the kitchen, splashbacks, feature walls and door inserts are a really great way to seamlessly integrate this year’s trending colours including the Pantone Colours of the Year – Rose Quartz and Serenity. Stylishly modern, these functional glass features will instantly update the look, feel and style of your kitchen, without the need for a complete kitchen renovation – or overpowering the space with an overwhelming colour scheme. At DecoGlaze our collection of Coloured Glass Splashbacks come in an exclusive range of colours, images and patterns, and can be made into customised hues to meet the exact vision for your kitchen. They are also super easy to care for, as they eliminate grout lines and other frustrating nooks and crannies. For those on a tight budget but in need of a good kitchen transformation, this is the subtle colour renovation for you. Colour trends for this year include pastels, gem inspired hues likes quartz, metallic coppers, and rose golds. Pair the new hints of colour with matching or complementary kitchen accessories like the retro 50’s inspired range from SMEG for a truly fun kitchen. TIP: If you are thinking of selling your home soon, a colourful kitchen can sometimes be a hard sell. Consider going with a neutral palette (see trend 5), and adding colour in more temporary ways. 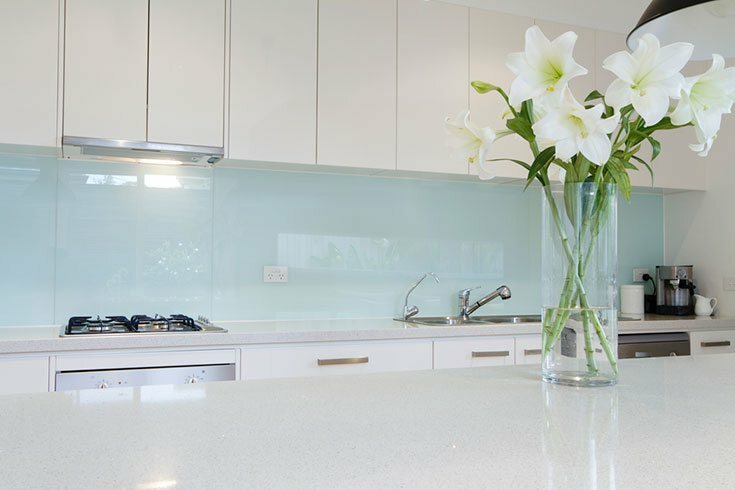 The upside from choosing Decoglaze is our glass splashbacks come in such a wide variety of colours, we’re sure to have something to suit every look. This trend is for all the boho, rustic lovers out there who can’t quite stick to one theme. Think global traveller, or modern meets vintage, when designing your kitchen renovation around this trend. The smaller details can make a big impact, so focus on everything right down to the floor. For some inspiration check out this chic Manhattan apartment that utilises tiles, wood, glossy benchtops, and even a rug! Whilst this mixture might seem like a recipe for disaster, it actually works very well. This eclectic vibe kitchen trend is really doable if you’re on a budget. Check out garage sales, op-shops, estate auctions, and even your local dollar stores for kitchen accessories, appliances, tableware, materials and even furniture that will lend itself to a slightly unconventional, yet invitingly charming space. TIP: This is the perfect trend for those who love a little bit of upcycling! 2016 is also loving minimalist designs with a neutral colour palette. Sleek and sophisticated, this trend will make your home exude a simplistic, no-fuss elegance. Think matte greys, contrasting monochrome hues, and natural wood tones with sleek lines and organic features. Don’t be mislead into thinking a minimalist kitchen means a boring kitchen. This trend is fantastic for home renovators because it can be incorporated through quick and easy changes, or bigger more expensive renovations. It also is a great look when trying to sell, as it allows potential buyers to work with a slightly more blank slate, rather than try to imagine themselves in a eclectic space. So if your kitchen is desperately in need of a pick-me-up, consider re-painting and accessorising with a neutral colour scheme to enhance the natural light of the space, or incorporate some natural timbers into your benchtops and cabinets for an earthier feel. If you are feeling adventurous, look into contemporary storage solutions (see trend 6 for inspiration), that will make your kitchen effortlessly sophisticated. From Shaker style cabinets to contemporary integrated work stations, a kitchen in 2016 isn’t complete without practical storage solutions to make use of every inch of space, whilst also remaining seamlessly hidden and stylish. If you are thinking about renovating your kitchen, it’s always good to start your discussion focusing on how much space you have to work with, and then ways you can keep your counters and benchtops free from mess. For example, a pull out knife organiser that hides away under the kitchen counter will give you some much needed extra space, and will also keep little hands away from any accidents if you install a lock. It’s a simple renovation, but a smart one. Don’t just think of massive changes – small ones could make all the difference too. Optimum storage solutions might be a bigger issue for you if you live in a small home or apartment. If this is the case, it’s important to start looking into more innovative kitchen designs that integrate storage within every feature. This includes multi-tiered drawers and combination shelves, which you can buy from stores like Ikea, that make the most of every bit of space. For a quote on what DecoGlaze can do for your kitchen, fill out our online quote form, or contact us.